If you are interested in being an artruck artist, let us know. Now, choose the art you would like us to display. Choose up to 4 pieces. We will make the curatorial decisions based on all of the work that is submitted and how it will fit with the room in the trucks and the displays. All art MUST be 2D with a wire on the back for hanging. We cannot hang matted items without a wire. You can submit up to four pieces (no bigger than 24X30ish). Affix wire on the back of your art. Attach a label on the back of each piece with your name. If you submit more than one work of art: we hang the art on Saturday morning of the event. If space is limited, the size and shape of the work may determine what we include. Be present at artruck for all three hours, 7pm – 10pm. This is not a commercial venture so we are not involved in sales. However, you may deal individually with sales privately so we need you there. Bring some kind of food to share at artruck. Finger food is easiest–we cannot supply serving utensils, silverware or plates/bowls, so make sure you bring what is necessary. Deliver your art on the Friday before artruck after 5 PM. 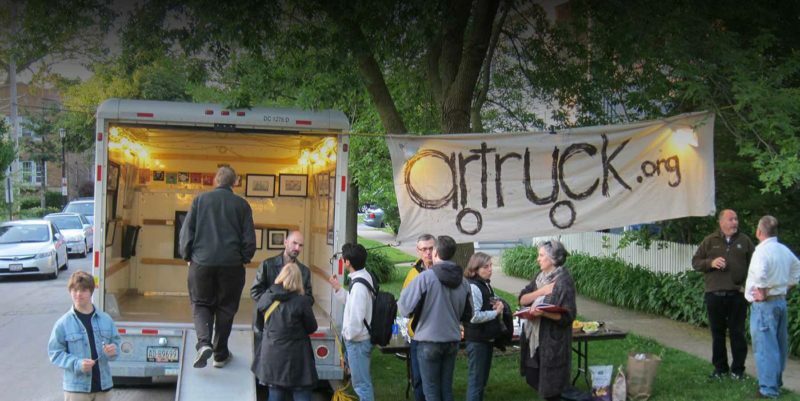 Art needs to be delivered to Evanston the night before the event. SEND OUT INFO AND INVITES TO YOUR FRIENDS!!! We want a good turnout!